For commercial outdoor umbrellas in Sydney, few come close in terms of the durability, longevity, and performance of the SU10 Commercial Centre Pole Umbrella on offer by Ashadya Shade Sails & Blinds. The SU10 Commercial Umbrella is a fully commercial grade umbrella that is used for any application, including residential applications, but it is best suited for commercial applications due to the custom branding options that it offers. The SU10 Commercial Umbrella is the umbrella of choice for many Sydney businesses and it isn’t hard to see why. It offers a range of customisation options to suit your needs and application. Choose from a concrete or steel portable base, choose either a square or octagon canopy in a range of sizes, choose a colour that matching your company’s branding and customise it with your logo. If you’re looking for commercial outdoor umbrellas in Sydney, stop searching and choose the SU10 Commercial Umbrella. Have your business support a local business by purchasing your commercial outdoor umbrellas from Ashadya. We are located in Galston, Sydney and service the surrounding areas of the Hills District of Sydney, North Shore and beyond. 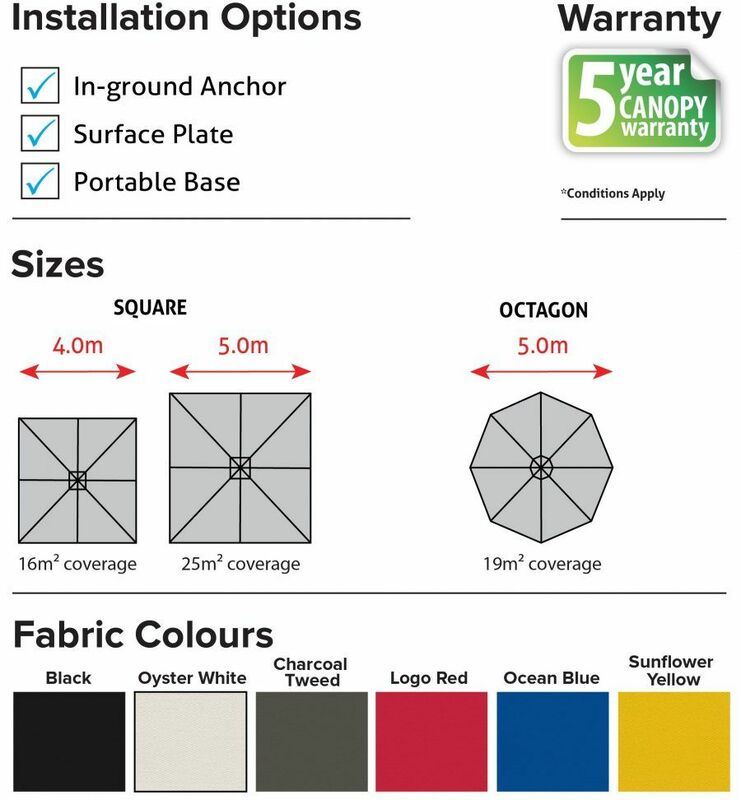 Call 1300 570 901 today for more information on the SU10 or any product in our outdoor umbrella range.